Minamishima is located in a side street off Bridge Road in Richmond. On the ground floor of an apartment block, it’s not easy to find – in fact I walked straight past it twice. But once you’ve hunted it down and stepped inside, you find yourself in a whole new world. A world that’s refined and serene. Minamishima opened in 2014 and the name comes from the chef and owner Koichi Minamishima who has well over two decades of experience in the art of sushi. This is not the place for a raucous night out with your mates – it’s way too classy for that. 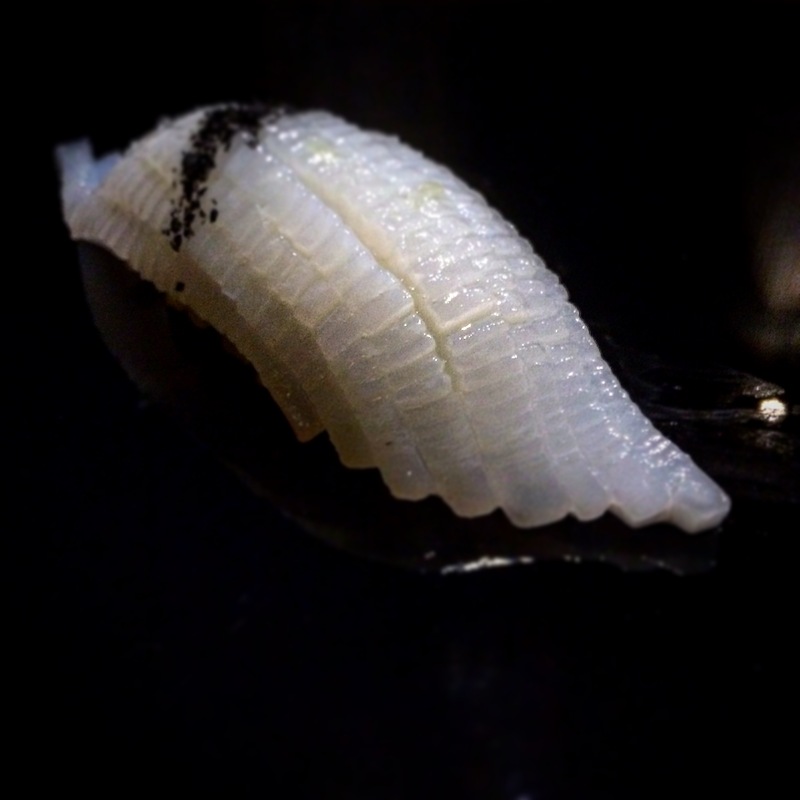 It’s the elegance of the omakase dining that you come here for – a wonderful chef’s choice sushi experience – mostly nigiri-style ($150 per person, sake and wine pairing an additional $70). And don’t even think about sitting anywhere but up at the sushi bar. Sit anywhere else and you’ll miss all of the action and the theatre that makes Minamishima such a unique experience. Having said that, you do have the option of sitting in the dining area where you can enjoy a different menu including plattered nigiri and some cooked dishes. The food would still be amazing, of course, but it would be a different experience. Back to the sushi bar, you can’t help but be mesmerized by the focused chefs in their white jackets and hats, the super-fresh seafood, the knife skills, the occasional blow torching. It’s sheer joy as you savour each individual morsel that’s presented to you. There’s no greedy gobbling here. Before you even place it in your mouth you need to pay it respect and admire it from every angle as it glistens at you and whispers ‘come hither’. And as each piece arrives, the chef provides strict instruction as to whether or not it’s to be dipped in soy. So many establishments these days are touting the use of purely local produce. Minimashima showcases not only the local but also seasonal seafood fresh from Japan. There was no menu provided so I’ll just have to go with what I managed to take note of. We started off with sweet shrimp on walnut tofu. I simply love raw shrimp – the natural sweetness and the texture. This was followed by (in order) King George whiting, blue eye, garfish, sea perch, calamari, Hokkaido scallop, flounder fin, prawn, tuna belly, tuna, salmon roe, Japanese mackerel, salt water eel, a custard made from Japanese mountain potato, clear soup with a prawn-stuffed zucchini flower and finally roasted green tea ice cream with Japanese grapefruit jelly. Three standouts for me were firstly the tuna belly, with its rich fattiness. Secondly, the calamari where you witness the most impressive knife skills – the scoring is so fine it makes for a whole different textural experience! Thirdly, and perhaps my favourite of the night, the flounder fin (the very outer edge of the flounder) which was a similar creamy fatty texture to the tuna belly. The lowlight for me was the dessert at the end – not really my thing. Minamishima offers an international wine list put together by manager and sommelier Randolph Cheung who hails from a number of well-known and well respected establishments, including The Atlantic, Saint Crispin and Flower Drum. I know very little, if anything, about sake but the word on the street is that his sake list is extremely good too. I was dining with someone who wasn’t really drinking a lot that night so I stuck to a sake-tini, and a couple of glasses of white. Minamishima is a very special place. I would love to dine there again. It’s attentive service, it’s freshness, it’s texture and balance. You can’t help but leave with a sense of awe and respect.